In June 1926, fifty-two years after physician Andrew Taylor Still founded a school of osteopathy, ten surgeons met during the American Osteopathic Association (AOA) convention in Louisville, Kentucky, to discuss the founding of a new professional association. Its purpose: to set high educational standards for its members and to provide continuing surgical education. On January 26, 1927, that dream became a reality, and the American College of Osteopathic Surgeons was incorporated as a not-for-profit, tax exempt organization, formed by visionary leaders who selflessly nurtured and directed the College and the profession. Their tireless devotion and countless contributions have been invaluable in raising training standards for osteopathic surgeons and thereby the quality of patient care and in giving osteopathic physicians a respected voice in the greater medical community and our nation’s capital. According to charter member Albert C. Johnson, D.O., the College's founders "were desirous of retaining the osteopathic concept in its relationship to the practice of surgery, for each of them was sufficiently experienced in surgical practice to recognize the value of Dr. Still's teachings in the care of surgical patients. 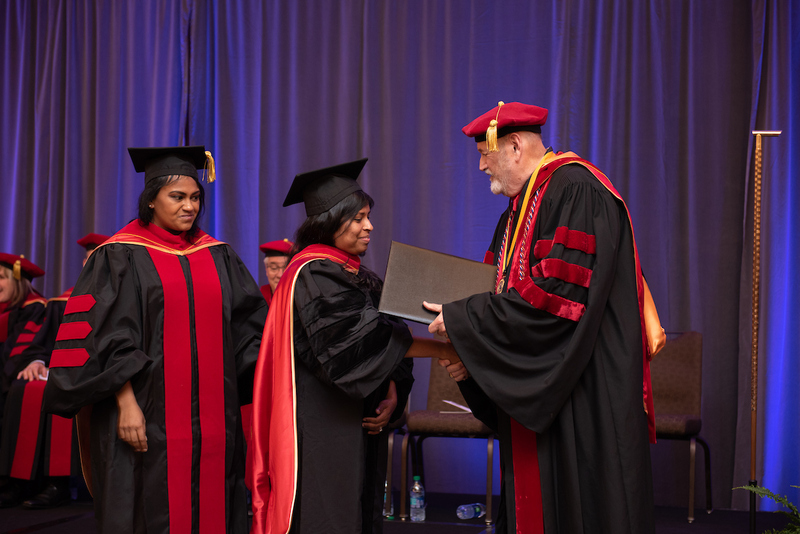 Up to the present time that osteopathic influence still prevails wherever the members of the American College of Osteopathic Surgeons gather." From its earliest years, the College set standards for teaching and nonteaching hospitals in cooperation with the AOA's Bureau of Hospitals. In addition to hospital inspections, the ACOS made recommendations to the AOA regarding the qualifications surgeons had to have to operate in approved hospitals. Until the ACOS developed these standards, the only qualifications required to do surgery were those established by individual hospitals. The College also set standards for formal hospital training programs. This was especially important because at the time the ACOS was founded, the surgical residency, as it is known today, was unavailable in osteopathic institutions. Most surgeons received their surgical training through preceptorships, serving as apprentices or assistants to surgeons until they were deemed qualified to perform procedures on their own. Such training was often supplemented by having surgeons visit outstanding teaching centers in the United States and Europe. As another of their early tasks, ACOS founders decided to allow interns who had fulfilled certain requirements the opportunity to work at other hospitals for a period of one month; all of their expenses were paid. This was the first time trainees were able to participate in a so-called "out-service" program. Participating hospitals included Southwest Osteopathic Sanitorium in Wichita, Kansas; Monte Sano Hospital in Los Angeles, California; Lakeside Hospital in Kansas City, Missouri; and Massachusetts Osteopathic Hospital in Boston, Massachusetts. 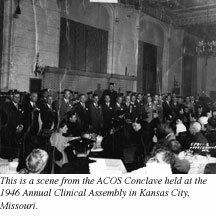 Throughout the 1940s, the American College of Osteopathic Surgeons (ACOS) continued to raise educational standards and improve hospital training programs. It also established criteria for recognition of emerging surgical specialties and helped create the American Osteopathic Board of Surgery (AOBS) to certify the qualifications of osteopathic physicians. The following decades were filled with numerous firsts and achievements, such as the development of stringent educational standards for surgical training programs and mandatory continuing education requirements; the establishment of the Annual Clinical Assembly (ACA); and the reorganization of the Board of Governors to better represent the membership and meet its professional needs. Eventually, ACOS disciplines were organized according to the following categories: general surgery, neurological surgery, plastic and reconstructive surgery, urological, and cardiothoracic and vascular surgery. Time and again, the College has prevailed through its determination, persistence, and belief in its mission. We thank our founders and all of the members who have volunteered their time to improve the profession.